The Lysicrates Martin Prize celebrates the best new Australian writing for children aged 8-12. 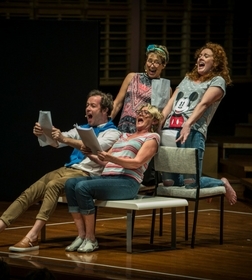 Playwrights have submitted the first act of a brand new play to the Prize, and the three finalists’ entries will receive a staged reading on Saturday 14 October at Riverside Theatres, Parramatta at 12.30pm. The audience on the day will vote for the winner (only children get to vote) who will receive a full commission to complete the play. Help our youngest audiences have a say in the future of Australian theatre! House by Dan Giovannoni – Part fable, part mad-cap adventure story, House is the story of a little big girl (a little girl who is big), making her way through a magical realm. The play looks at some of the more challenging aspects of growing up and living in the world – sadness, grief, loneliness – and the need to embrace these elements in order to be a whole and complete person. The Zookeeper’s Daughter by Verity Laughton – A Circus of Fabulous Beasts, a mysterious box of tricks and a perilous adventure for a young girl and her companions. The Zookeeper’s Daughter is about bravery, friendship and trust (and a baby Basilisk). Summerland by Katie Pollock – All the kids understand they must keep quiet about the strange boy they’ve found, that he’ll be in more danger than he already is if the adults know he’s here… Summerland is a holiday adventure of the very best kind, full of excitement and peril, unexpected challenges and the bittersweet lessons of growing up. Tickets are free – please note transaction fees do not apply for this event. The Lysicrates Martin Prize is presented by National Theatre of Parramatta, The Lysicrates Foundation and Griffin Theatre Company.